A super boy fighting against ASD & T21: I am finally teething, Yahoo! My mommy and my daddy always knew teeth eruption delay may happen to kids with Trisomy 21. They also think I could be a late teether because there are late teether in our families. Therefore, they were not worried about me having my teeth late. I have been cranky since last week which is unusual on me. I didn't know how to tell my mommy. I signed "hurt" several times and my mommy didn't get it. Then, I have put my little hands in my mouth to get some relief. My mommy took me to the Aqua Therapy on Monday and I suddenly cried for no reason. My PT saw that lower gum were very swollen. We went to the family room to change my clothe after the therapy. My mommy checked my gums and then, Surprise! There are several teeth coming at the same time. 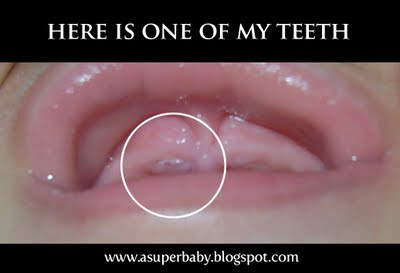 There are three teeth coming in the upper gum. Two teeth already cut and one is cutting. It seems 4 teeth will soon cut in the lower gum. It seems that I have 7 teeth coming. My mommy and my daddy are happy because I am teething. But I am not "it hurts". My mommy gives me teething tablets and they are really good. I do "Mmmmm" every time she gives me them because they relief the pain and they are tasty. The best of these tablets is that they are 100% Natural without side effects. You know my mommy, always looking for good stuffs for me. I am ready for my teeth because my mommy already taught how to brush my teeth; even although, my teeth were coming late. Maintaining good oral hygiene is very important. When I was a baby, my mommy daily cleaned my gums with a Nuk brush. Now, I do brush my teeth with supervision. My mommy and my daddy will take me to the Dentist for an examination. I will write later to let you know how my first appointment with the Dentist is.